I love Confessional Friday, don’t you? Thanks to Leslie from A Blonde Ambition for hosting such a fabulous link up each week! …It still confuses me that the Superbowl is not an afternoon activity. In California, it was always an afternoon thing. On the east coast (duh, time change) it starts in the evening and I hate it. …Although sometimes Archie seriously behaves like the worlds worst only child, last night we watched an entire episode of Modern Family like this. He wants to be like Phil when he grows up (who doesn’t?). …I’ve been seriously considering either getting bangs (remember the last time I wanted to get bangs?) or chopping my hair off. If I did chop it off, I’d donate to either Wigs for Kids or Children with Hair Loss. Did you know Locks of Love charges the families for the wigs? …I may be the only person who really doesn’t care that Beyonce lip-synced the national anthem. Why do people keep beating her up about this? Would you want to screw up with the President there and the whole world watching? Yeah, me either. …Archie seriously snores. And he’s super melodramatic. Yesterday he started choking on the tiniest piece of cookie and my heart leapt out of my chest and I freaked out for a solid minute and a half, after which he was completely fine. I thought he was suffocating. The little jerk was just overreacting (who does he get that from, I wonder?). …I’m so excited to start Content Brew with momcomm.com and my Photography class next week. This is the first time I’ve ever truly wanted homework. …I really don’t get how fashion bloggers keep doing it in January. I’ll go ahead and give you the only thing you’ll see me wearing in public until the end of February. Thanks, L.L. 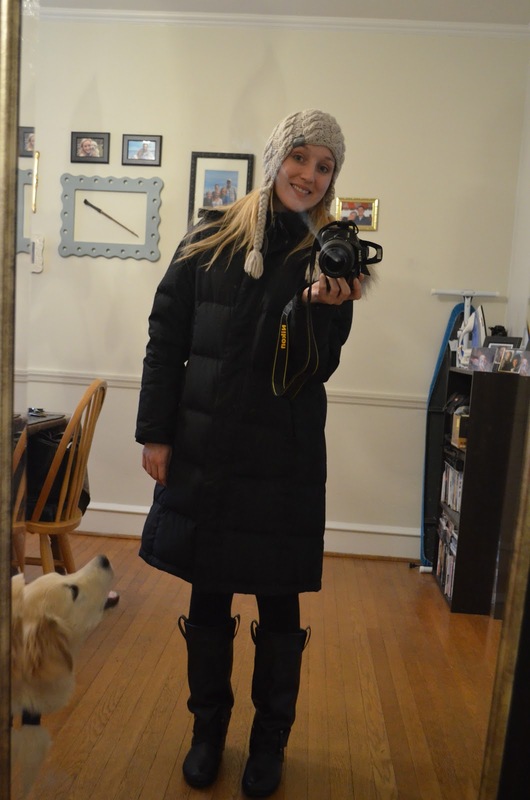 Bean for making the worlds warmest jacket (it’s on sale right now!). I’d never have survived the east coast without it. See my bratty only child? Angry he isn’t the center of my attention for .01 second. …Kaylin and I are taking suggestions about where in the country we should visit. We’ve been to: Austin, New York, and Boston together. What U.S. city do we absolutely have to see? Nashville? Miami? New Orleans? …I’m the only person in the country who LOVES tax season. Paying tons of student loans of insures that you’ll get a nice big tax return. I filed mine the first day they’d accept them. …If you knew me in real life, you’d know that I sing everything I do. Just silly songs to myself. They don’t rhyme and I have a horrible singing voice. Archie loves it; Naveed, maybe not so much. …I woke up this morning to a light flurry and I have to say, it always makes my heart skip a beat. I’d do anything to have a day where we couldn’t drive anywhere and my brother Curt and I just attempt to build an igloo for the 500th time (unsuccessfully). I hope you’ve had a wonderful week! Stopping by from A Blonde Ambition? Leave a link to your confessionals below!